Our ankles are bound with sheets of a fibrous band of fascia, called retinaculum. You can imagine that when you sprain your ankle and wrap a crepe bandage around for support, this has a similar look. In our ankles this retinaculum covers various tendons which all help to flex the foot. It is there to protect these tendons. It has a tendency to get a bit inflexible if we are unable to move around for long periods of time, if we have to sit down for work or travel. 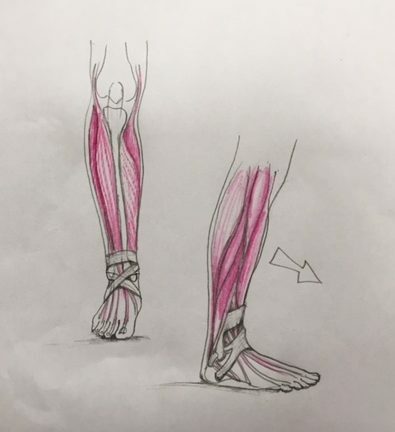 Once this starts to become less flexible, it does not allow us to bounce off the balls of our feet as well, we become a little more ‘flat footed’ and our stride shortens as a result. This in turn can put strain on our hamstrings (already often a bit tight and tetchy from being squashed as we habitually sit on chairs). This chain of events can ultimately end in lower back pain or hip pain as the tightened hamstrings can pull the bones of the pelvis. For sports people, lengthening your stride will make your speed faster, stable and more efficient. Clients of mine have reported a significant improvement in their running times when the retinaculum has been worked on. So a great way of ensuring a nice long bouncy stride is to keep the ankles moving back and forth. If your retinaculum is already feeling restricted, dont worry, a good deep tissue massage with attention to the fascia in this area can help it to become more flexible once again.